As per the Hindu tradition, Sun is considered Holy and divineas it supports life on Earth. In the ancient times our ancestors used to start their day by greeting the Sun and welcoming the new day in their life. It is mainly involves a procedure of 12 postures which are repeated as per the person’s stamina. 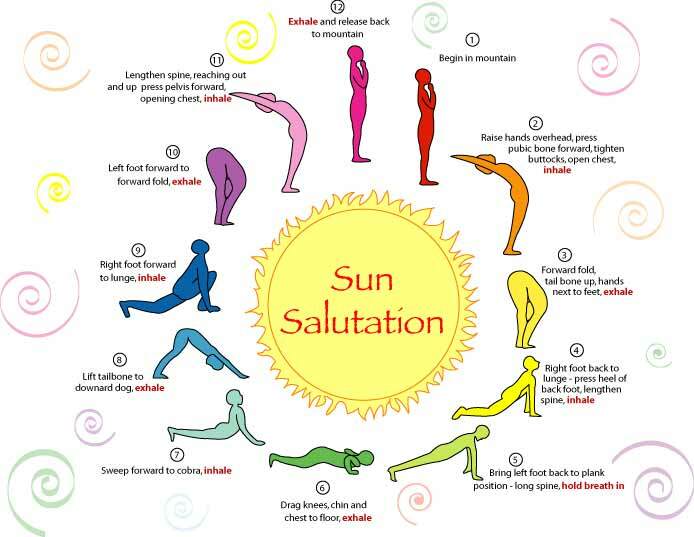 Performing regular Surya Namaskar (Sun Salutation) in the morning can enhance a person’s physical health and overall well being. It corrects your posture, stretches muscles and lets you inhale the freshness of the morning breeze. Surya Namaskara Step 1: Stand straight facing the sun while balancing your weight equally on both feet which are joined together. While breathing in, fold your hands in prayer. Surya Namaskara Step 2. Feel the warmth of the sun while chanting ‘Om Suryadevaya Namah’ thrice. While breathing in, take your folded hands up towards thesky. Bend backwards and make an arch from your hands to feet. Pushing the pelvic a little forward reach out to the sky with the tips of your fingers rather than bending. Surya Namaskara Step 3. While breathing out, slowly bring your hands down and bend simultaneously bend to touch the either side of your feet. Make sure that you do not bend your knees and keep your head as close to them as possible. Surya Namaskara Step 4. While breathing in push your right leg back as far as possible and look up. Surya Namaskara Step 5. While breathing in take the leg back parallel to the right one and bring your body to a straight line. Surya Namaskara Step 6. While breathing out, bring your knees to slightly touch theground and raise your hips slightly while resting your chest and chin on the ground. While raising your posterior make sure that eight points of your body touch the ground (palms, feet, knees, chest and chin). Surya Namaskara Step 7. While sliding forward, inhale and look up (shoulders away from the ears). Surya Namaskara Step 9. While breathing in bring your left leg forward in between hands, ensuring that your right calf is perpendicular to the ground. Pushing your hips down look up to the sky. Surya Namaskara Step 10. Exhaling, bring your left foot forward beside the right one. While keeping your hands on the ground, slide up such that your nose touches your knees. Surya Namaskara Step 11. Inhaling roll your spine up, let your folded hands go up towards the sky and stretch backwards making an arch (stretch up rather than backwards). Surya Namaskara Step 12. While straightening your body exhale and bring your hands down. While relaxing observe and feel the sensations in your body. Bring these 12 postures of Surya Namaskar (Sun Salutation) in your life and have ahealthy body and soothed mind. These were the 12 signs of Surya Namaskara also known as Sun Salutation. In Yoga, Suryanamaskara has got a significant place for healing many ailments. As per Hindu Scriptures on Yoga, it is believed that one who performs Surya Namaskar on regular basis from childhood never gets prone to severe physical diseases. As it is amongst the easiest forms of Yoga, Suryanamaskar can be performed by almost everyone.